The Technician training videos on YouTube are now updated for the 4th edition of the ARRL Ham Radio License Manual. In addition, by popular demand, I make them available on a USB Thumb Drive for US$29.99, postpaid anywhere in the United States. See here for details. This is good news for those who can’t always get online to study, such as those with poor Internet connectivity, commuting on trains or busses, etc. This thumb drive with all the videos would also make a great gift for those of your friends or family who would make great hams once they get their license! You are welcome to use the videos during club meetings or for training classes. See the details on the purchase page. 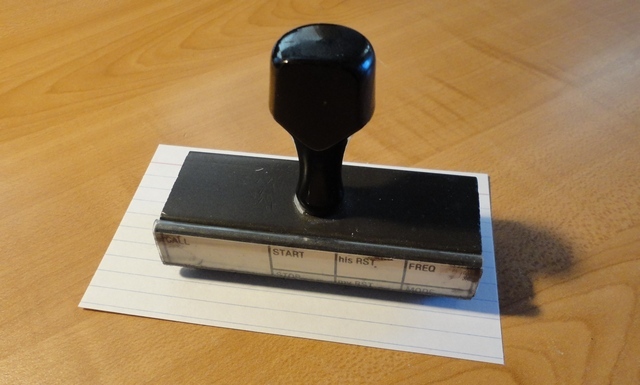 Clear image of my logging stamp for use with any notebook. Thanks Gwen Patton, NG3P. Here are the charts I used in Ask Dave 14, “Anatomy of a CW QSO,” by request. These PDF charts walk you through a typical exchange for a brief conversation in Morse Code. Click on this: A typical CW exchange. I hope the charts help you be more comfortable on CW! Watch the time lapse photography as I assemble the MFJ-1846 six-band hex-beam antenna. I also explain how hex beams work. Ray Nelson is one of the principles at MPD Digital (usacoax.com). I spoke with him at length about connectors for coaxial cable. Enjoy our 30-minute chat! What can we learn about the Inverted Vee HF single-band antenna from the EZNEC+ model? Lots of things, having to do with height above ground, the amount of spreading, and using a metal pole as a mast. Tune in for full details! Viewers queried me about what happens when you shorten a dipole by letting the ends hang down, or have to put up a dipole that can’t be in a straight line, and I was also curious about the effect of my aluminum masts on horizontal dipole performance. EZNEC+ to the rescue. The video shows that modified dipoles can work quite well.